First of all, the size of it. It's a little bigger than my old 5110. Official dimensions from Nokias site list it as (LxWxT): 134 x 58 x 28 mm, which is only bigger by the 5110 by a matter of millimeters. Seriously, you can’t feel the difference in your pocket. Some of the basic stuff first. 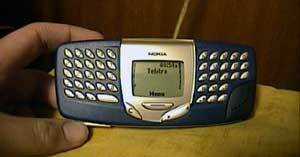 The Nokia 5510 is a normal mobile, only spun around 90 degrees. It has a full QWERTY keyboard which allows quick typing of SMS messages, if only with two thumbs ;) It has the normal “Navi-Key” (basically the Enter Key) and the Up/Down buttons. The connector for ADE-2 Audio Line in Cable. 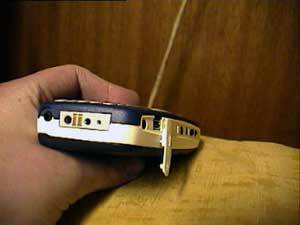 This stereo cable allows you to connect your Nokia 5510 to generic external audio system. Using this cable you can record music from your home stereo system, portable music player, or another 5510. The connector for the DKE-2 connectivity cable for PC Connection. 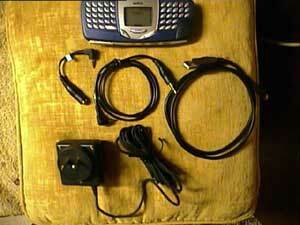 This USB cable allows you do connect your Nokia 5510 to a PC with USB port. 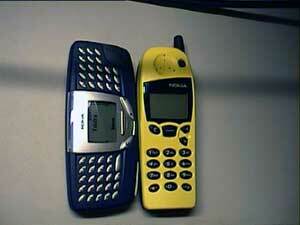 It provides a fast (100kB a sec –Ed) and convenient way to download music from your PC to the Nokia 5510. Two contacts for what I would presume to be the Car Kit. The short cable is the ADA-2 Cable. This has a 2.5mm stereo connector on one end, and a 3.5mm Stereo socket on the other. 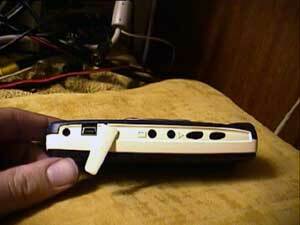 Basically, it lets you use “normal” headphones with the 5510. Next is the ADE-2 Audio Cable. 2.5mm Stereo Plug on one end, 3.5mm Stereo plug on the other. Allows connection to other audio devices, or, in conjunction with the ADA-2 (above), another 5510. At the very right is the DKE-2 Connectivity Cable; The USB Cable. Connects your 5510 with your computer. I’m not going to go into the details of how the “phone” performs…talktime and the like. Most of the questions on the Forums have been concerned with the MP3 and Radio Functions, as well as the ability for the 5510 to function as a “USB Storage Device”. This review will be concerned mostly with those functions.